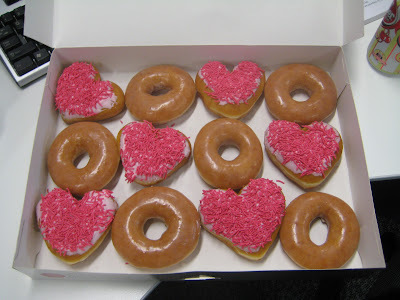 This year for Valentine's Krispy Kreme are making a pink iced donut heart perfect for the nerd chick in your life to get fat on (eg. Me!). My company are selling boxes at work to raise charity money for the bushfire relief fund. In the side of the picture you can almost see my can of Diet Dr Pepper to really round out the American overly sweet low food content approach to my morning tea; mind you this was somewhat important because I foolishly ate two of them at once and the soft drink was required to eat through the brick of fat and sugar currently sitting in the pit of my stomach. Damn but it was worth it.